Whenever someone answers with formatted text it looks just like how it would when they're typing it. Sometimes it works randomly, like I am able to see how it should be, but most of the time it does not. I've tried both Google Chrome and Mozilla Firefox but they have not worked. Has this ever happened to anyone before, and is there a fix for it? I have also experienced similar problems with formatted math on MathSE, and I do not believe that it can be explained by a slow computer. I am using Windows XP and Google Chrome. All updates have been installed. The symptoms appear at random, upon starting Google Chrome and going to Math SE. If everything works, it keeps on working for the session, as I move from Math to Physics and back. If it doesn't work, it won't start working until I leave Google Chrome and come back, sometimes several times until it kicks into correct operation. At first, I see the MathJax text as typed in line: every character, including the dollar sign delimiters, in the same type face as the non-MJ text. After a few seconds, this changes. The dollar sign delimiters disappear and the remaining MJ still appears as typed, but now in a grey text colour. On slower computers, slow connections or pages with a lot of formulas to render, the text may appear unformatted at first. This is a known issue and is intended behavior. For example, this Physics.SE page has so much text to render that the effect should be visible on most sorts of computers and connections. Not the answer you're looking for? 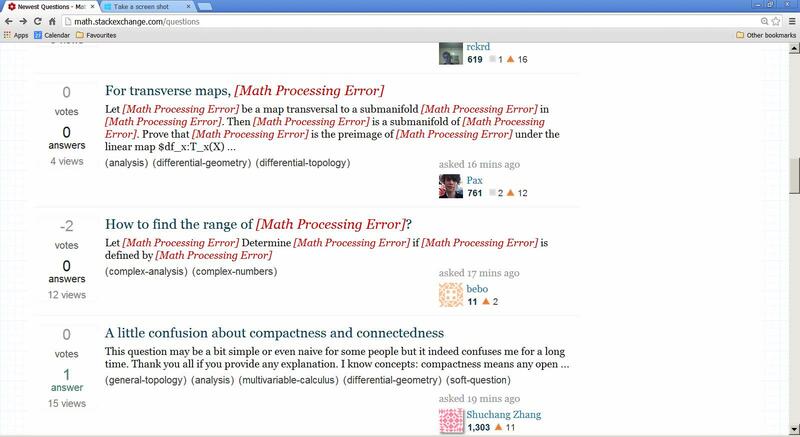 Browse other questions tagged discussion bug status-bydesign mathjax formatting .